The DFW Metroplex is America’s fourth biggest city. Yet, like many destinations, it suffers from a significant awareness and understanding deficit both domestically and abroad. The situation is shown below, using findings taken from our most recent The State of the American TravelerTM survey–a nationally representative survey of 2,000 domestic leisure travelers. 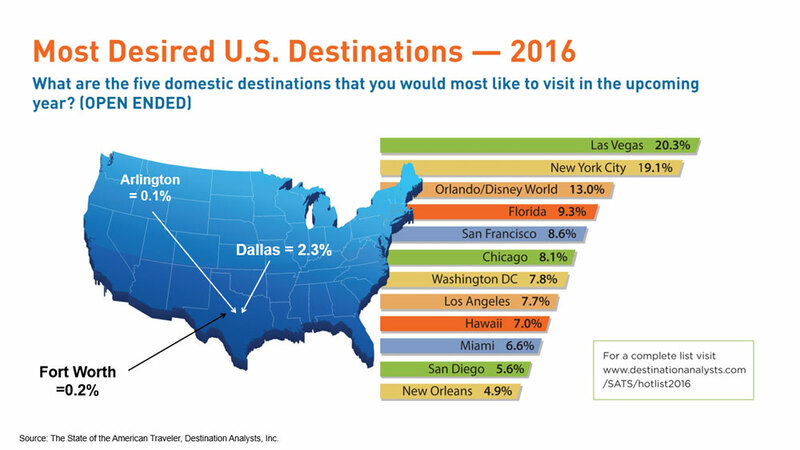 When asked in an unaided question to write in the five domestic destinations they most want to visit in the upcoming year, only 2.3 percent wrote in Dallas. The only other area cities receiving votes were Fort Worth (0.2%) and Arlington (0.1%). These disappointing results are, of course, not commensurate with a great city like Dallas. What’s beneath this situation? Despite the outstanding efforts of the metro area’s DMOs and the tourism community overall, the Metroplex obviously faces stiff competition from many compelling and well-funded destinations around the country. Obviously, too, the destination’s message hasn’t penetrated deeply into travelers’ awareness. 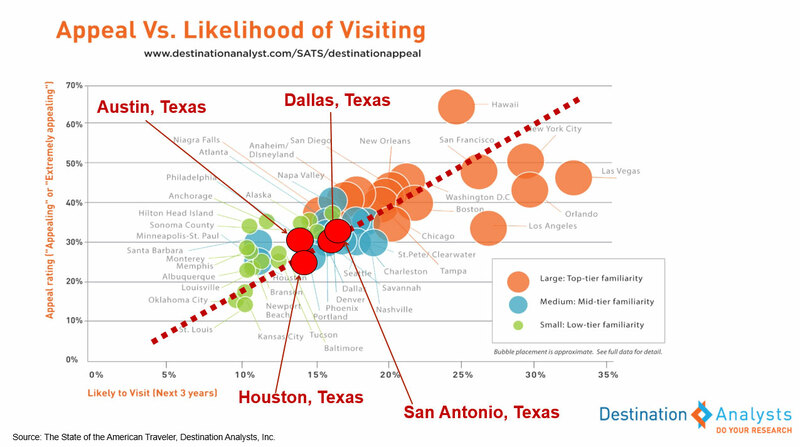 The chart below shows (for numerous destinations) the relationship between destination appeal, perceived traveler familiarity, and likelihood of visitation. The chart shows visually that the more appealing a destination is, the more likely travelers are to say they are likely to visit it. Further, higher levels of familiarity foster both appeal and likelihood to visit. In this perspective, the Metroplex, while outpacing in-state rivals Austin and Houston, sits in the rear-middle of the pack nationally. This is no place for what is undeniably one of the nation’s most unique and vibrant communities. In our view, this dramatically highlights the need for local communities to continue to support (and very importantly fund) the marketing efforts of area destination marketing organizations. We won’t go into the detailed data in this blog post, but Dallas’ story is the same for international markets. Our The State of the International TravelerTM survey asked 800 likely international travelers in each of 14 major international feeder markets the same set of questions—measuring traveler familiarity, destination appeal and likelihood of visitation. These international results mirror the domestic ones, with Dallas getting relatively low rankings for all three metrics when compared to an array of other U.S. destinations.